Herman Cain sexual harassment charges: The three arguments Republicans are using to defend him. The three arguments Republicans are using to defend him. 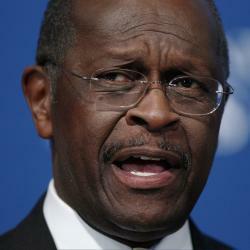 Republican Presidential candidate Herman Cain speaks at the National Press Club on Oct. 31. Rep. Steve King represents the conservative bluffs of western and northwestern Iowa. He has personally shepherded the Republican Party’s would-be presidents around his state. He hasn’t endorsed any of them yet, but he sees Herman Cain fighting off a scandal, and it gets his blood pumping hot. King is not the only conservative saying this. Three days into a scandal that’s collecting mass and speed like some fast-rolling lava floe, a third woman and a Republican consultant have emerged with more allegations of “very uncomfortable” 1990s-era Cain harassment. Yet Republicans are not abandoning Cain. The people who stand to gain if Cain implodes are mostly quiet about the stories. The rest of the conservative movement has risen up in anger at the media for even covering this stuff. On Wednesday, as Cain bounced from suburban Virginia to Capitol Hill, dodging TV cameras and pissed-off reporters, it was basically impossible to find a Republican who wanted to pile on. As of Wednesday there are three main arguments being mounted in Cain’s defense. Let’s count them down, from flimsiest to Most Likely To Succeed. Cain has had an on-again, off-again relationship with the “race card.” He hates it, and he thinks no one should use it. Months ago, I was in a tiny scrum with Cain (boy, those days are over) when a British reporter wanted to know whether the mostly white GOP could ever support him. “Am I black?” joked Cain. He couldn’t care less! To understand this defense, you have to understand something about conservatives: They think Democrats use it all the time. Why shouldn’t Cain spit it right back at them? It’s only fair. And then they think harder on it, and realize that they hate it when Democrats do this. After the Washington Post’s conservative blogger Jennifer Rubin saw Cain talk to Krauthammer, she attacked “Cain’s noxious racial politics.” Ron Christie, an African-American Republican strategist who materializes on cable news in times like these, describes just how icky it feels. Effectiveness level: Risky, with high chance of backfire. On Wednesday afternoon, Cain did a quick Q&A with Republican members of Congress working on health care. Rep. Michael Burgess, who called the meeting, ribbed the press for showing up with questions about the scandal: “I have every belief you’re going to look into this as carefully as you looked into President Obama’s college grades.” After the meeting, the Republicans were unanimous: Cain should ignore the scandal and keep talking like this. It’s fun, and it’s familiar, but how does it help Cain? This isn’t a case of a media outlet formulating a story out of nothing. This was a story that multiple organizations had heard inklings about, that Politico did the work on, and that its reporters backed up with primary documents. Effectiveness level: Limited, because the media isn’t the problem. Steve King, among Cain’s most vocal defenders, took me back to his days running his construction company and working with the Iowa Land Improvement Contractors’ Association. Sexual harassment training was a pain, an insult. After he and colleagues had to watch a 45-minute how-not-to video, he stood up and said, “I am insulted that you would burn up our time with something that could be replaced by the two words ‘common courtesy.’” The only woman in the room, he said, applauded. Let’s say that Cain has bungled away the nondisclosure agreements that the National Restaurant Association put away in the 1990s. The women in question come out and speak. At that point it’ll be their word against his. All those doubts about the very idea of sexual harassment settlements, all those doubts about whether this stuff can be trusted—that will come in handy. Effectiveness level: It’s the best he’s got.